Are Ranchers Out West Really Oppressed by a Federal Government in League with Environmentalists? Keith Makoto Woodhouse teaches in the History Department and the Environmental Policy and Culture Program at Northwestern University. 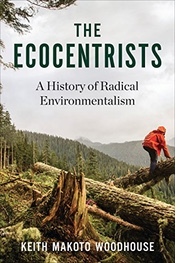 He is the author of The Ecocentrists: A History of Radical Environmentalism. This week Dwight and Steven Hammond, father-and-son Oregon ranchers sentenced to five years in federal prison for two counts of arson on federal land, join Joe Arpaio, Dinish D’Souza, and Lewis “Scooter” Libby as convicted citizens pardoned by President Trump. 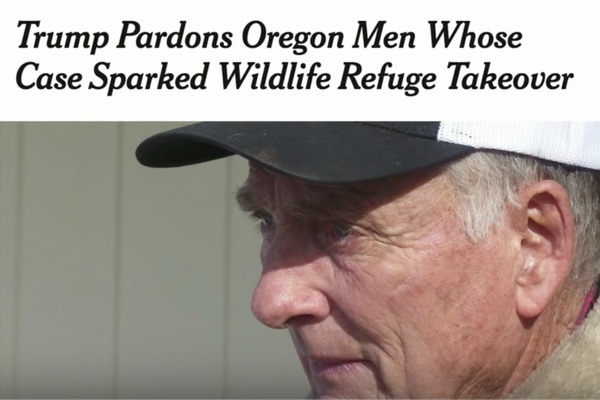 This pardon is more than a bit ironic, given the Hammonds’ connection to the 2016 armed occupation of Oregon’s Malheur National Wildlife Refuge. The occupation, led by brothers Ammon and Ryan Bundy, was the latest clash in a long-running fight the Bundy family has waged against the federal government, a fight that began in the early 1990s when the Bundy brothers’ father, Cliven, stopped paying Bureau of Land Management (BLM) fees for running his cattle on public land in Clark County, Nevada. The fight climaxed in 2014 when the BLM tried to confiscate Cliven Bundy’s cattle, precipitating a guns-drawn standoff between dozens of federal agents and hundreds of Bundy supporters, and it persisted through the 2016 Mahleur occupation, a protest against not only the Hammonds’ sentences but also federal management of Western lands. The first irony of a possible pardon for the Hammonds has to do with the role of federal power in the Bundys’ fight. The Bundys have championed the sovereignty of the state of Nevada and recognized federal authority in only a profoundly delimited sense; Ammon Bundy describes the government’s sentencing of the Hammonds as an act of “tyranny.” With Trump’s pardon, the Hammonds have been set free through one of the more explicit forms of executive authority the president wields, and so through the very federal power that the Bundys have consistently disparaged. Similarly, Trump has used the Antiquities Act—another example of executive authority—to diminish the extent of federal lands in the West, lands that the Bundys often point to as a prime example of overweening federal power. Further, Ammon Bundy has complained that the government expanded the Malheur refuge “at the expense of the ranchers and miners,” although ranching itself came at the expense of the Malheur Indian Reservation, onto which the federal government forced Paiute Indians in the late nineteenth century. Ranching in the Malheur area was facilitated, in part, by the federal government’s dispossession of the Paiute. In the West, the federal government is often the easiest solution to the problem of the federal government. The second irony concerns the role of the environmental movement. Environmental regulation sits near the center of the Bundys’ complaints. In 1990 the U.S. Fish and Wildlife Service listed the desert tortoise as a threatened species, and later designated a swath of the Southwest, including parts of Clark County, as critical tortoise habitat. The BLM, heeding the Endangered Species Act of 1973 and the Federal Land Policy and Management Act of 1976, tried to reduce the impact of cattle in desert tortoise habitat by modifying grazing permits, including Cliven Bundy’s. Bundy refused to adjust his cattle’s range and soon stopped paying grazing fees entirely. Years later, Ammon Bundy chose to occupy the Malheur Refuge in part because he felt the government had spent decades providing acreage for wildlife conservation at the expense of ranchland. The Bundys have tended to view environmentalists and federal agencies as of a piece. But the history of land management in the West is far more complicated than a story of rural resource users vs. big government and big city environmentalists. The modern environmental movement that emerged in the late 1960s and early 1970s did fix on the federal government as the best means for protecting natural resources and fighting pollution. Environmental organizations quickly became adept at using Congress and the courts to achieve environmental protections. New legislation, like the Federal Land Policy and Management Act, made conservation a principle at agencies that had long catered to economic interests. By the late 1970s, however, cracks appeared in whatever common cause had existed between environmental organizations on the one hand and presidential administrations and federal land managers on the other. In debates over Western public lands, tensions between environmentalists and public agencies grew particularly sharp. At the same time as Western ranchers and legislators very publicly decried federal land management during the “sagebrush rebellion” of the late 1970s, environmental organizations like the Sierra Club and Defenders of Wildlife privately discussed the diminishing returns of relying on federal agencies to conserve natural resources and to protect public lands. In 1979, when a U.S. Forest Service wilderness inventory recommended a disappointingly low acreage of national forest land for protection, some environmentalists had had enough. The Wilderness Society’s Dave Foreman called the Forest Service inventory “the greatest single act of wilderness destruction in American history.” Fed up with the compromises demanded by a strategy based on lobbying and litigation, Foreman and several other disgruntled wilderness activists formed a new, radical outfit called Earth First! Radical environmentalists like Earth First! used direct action to push bureaucrats into giving more of a damn. Where states’ rights advocates like the Bundys resented the federal government for doing too much, radical environmentalists criticized federal land agencies for doing too little. The Bundys’ all-too-simple view of the West—in which independent locals are beset by a tyrannical federal government allied with environmental groups—ignores the complicated and shifting history of a region that has long struggled to balance the interests of different residents and the jurisdictions of different governments. Trump’s pardon only underscores the ironies of antifederal sentiment amidst the fast-changing politics of the modern U.S. West.